Ninja Bean cocoa bean crackers from FBM feature an intake air flow and a crushing system entrusted to a cylinder with adjustment of the crushing space. 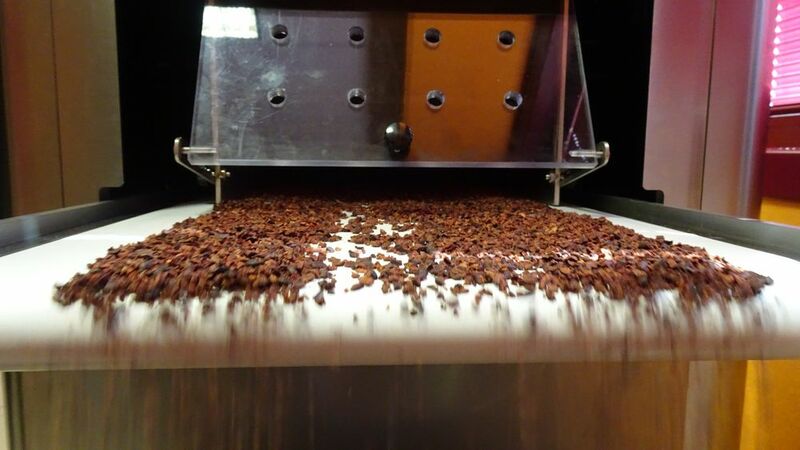 The unit cuts cocoa beans easily and quickly, reducing them in nibs, and separating them from the shells. Unit head, hopper and crushing cylinder are removable, providing for easy cleaning. The system offers the possibility of adjusting the aspiration speed, and also ensures the absence of dust and the reduction of steps for the separation of the nibs from the shells. The product is deposited on a conveyor belt in food-grade PVC, for an easy collection of the nibs. Shells, powder and processing wastes are collected into a cotton bag at the machine exit. Several units are available for testing this new solution in the Company’s Bean to Bar area. Here, three-days-classes are held every month, during which the participants can produce chocolate from cocoa beans. Cocoa beans come from Costa Rica, Colombia, Santo Domingo, Vietnam, Ecuador and Tanzania.